It is one of those cold, windy days where the only sensible thing to do is stay inside and maybe take a nap. 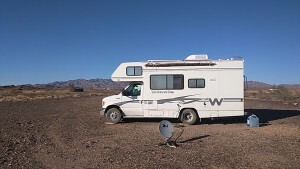 I’m camped with my friend, John, only five miles from Parker, Arizona. I moved here two days ago and we have had nice temperatures and calm winds until last night. Shortly after I went to bed last night the wind started rocking Minnie and making noises with the roof vents. I didn’t get much sleep. Every morning John and I walk 2 miles. 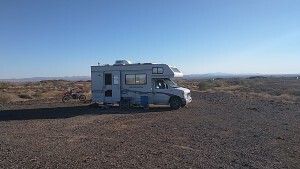 This BLM campsite is surrounded by mountains and deep washes. There is a long road running back to the foothills that makes a nice place for morning walks. If I get ambitious and the weather gets better, I may take Honda back a few miles to explore. There are quite a few campers parked in the dispersed pullouts along the road. It’s not crowded. 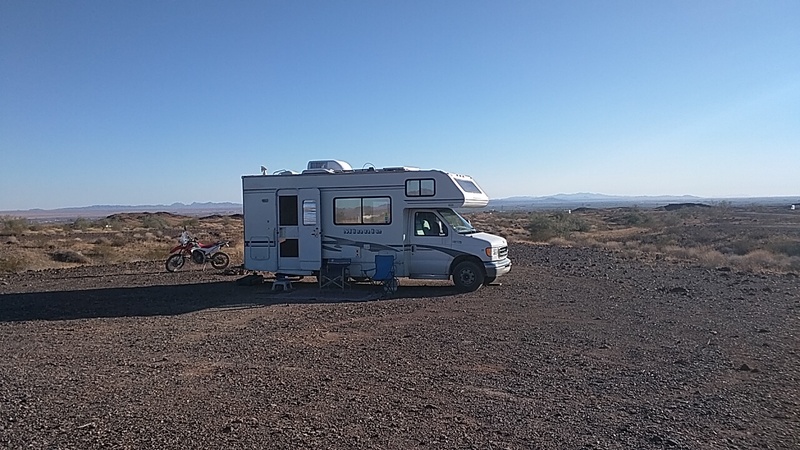 Most of the rigs are Class C’s, vans, and small trailers, and we all seem to find a little corner in the desert to call home. I have found few places to dump and get water near Parker, and I think that’s probably what keeps most of the big rigs away. 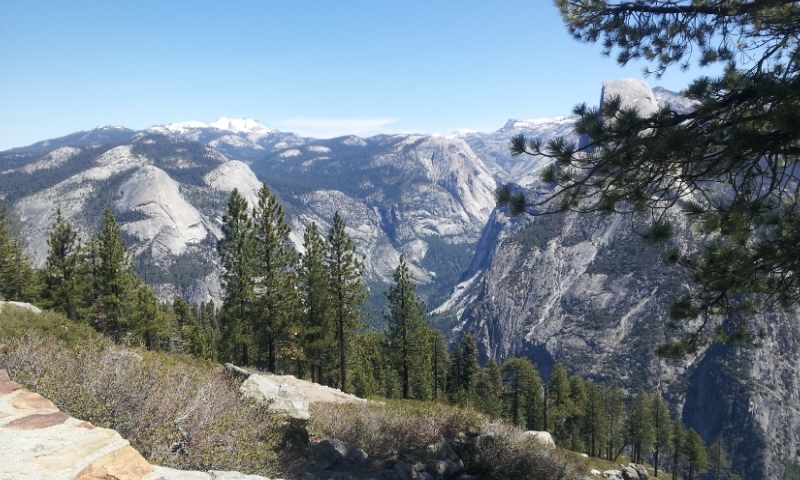 The cell service is excellent, and if you rely on OTA TV, there are many broadcast stations on antenna. The nice thing about this location is the fact it is only five miles to Parker and all the perks of a city. Yesterday, I rode to the Walmart, went to see a movie (Star Wars – The Last Jedi), and washed some of the grime and dust off Honda at a self carwash. I used a little restraint and drove right past McDonalds. I plan to be here until next week and then start back south. As long as I have the LTVA pass, I may as well take advantage of the facilities it entitles me to. 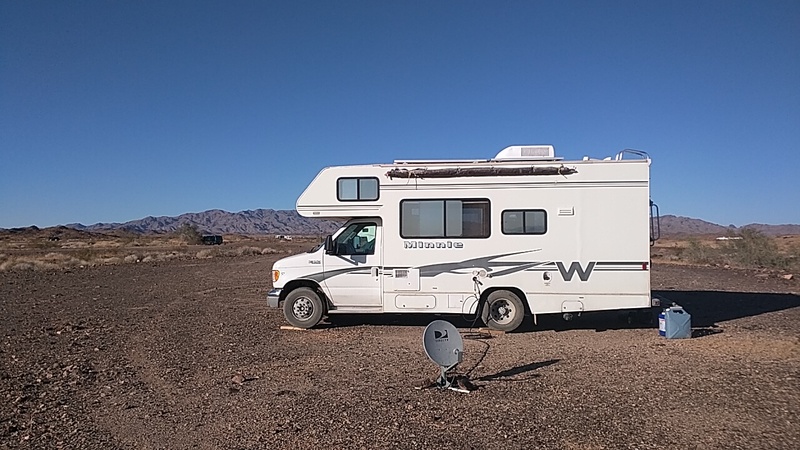 It’s only 40 miles south to Quartzsite, where I will camp for a few days, and then move down to Yuma after the first of the year. There are many places in southern AZ and CA I like to visit during the winter and the LTVA pass gives me the option to come and go as I please. Looks very desolate in the picture, but looking closely I can see hills and brush in the background. Still not a tropical paradise! Part of the adventure is finding new places to boondock for a while.